This is the final episode of the SQL for Data Analysis – Tutorial for Beginners series. Today I’ll show you some more advanced SQL moves! 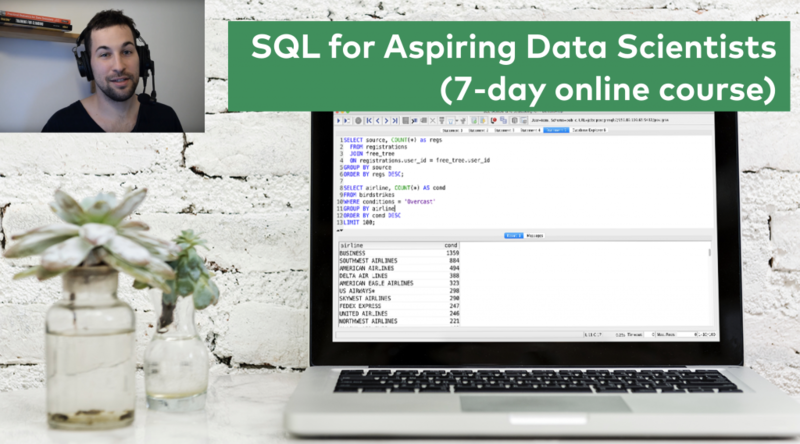 Though junior data analysts can live without them, I still recommend that you learn and use them as they will bring your SQL game to the next level and make you more efficient at your daily job. (Or if you don’t have a job yet, they will help impress the people in front of you at your data analyst job interview.) 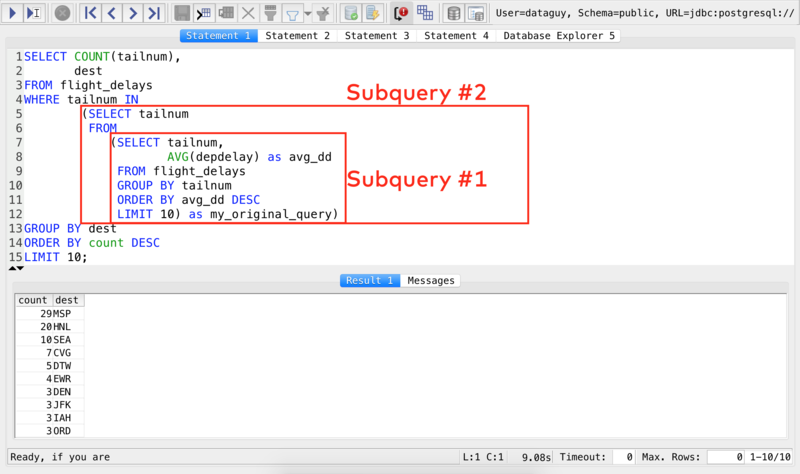 I’m going to show you: subqueries, the SQL CASE statement and the SQL HAVING clause! Note: to get the most out of this article, I recommend not just reading it, but actually doing the coding part with me! Select the average departure delay by tail numbers (or, in other words, by plane) from the table – and return the tail numbers (and only the tail numbers) of the planes that have the top 10 average delay times. Note: Let’s try to solve it with the tools we have learned so far! You can create a new table and put this result there. Then you can select the first column (tailnum) of that freshly created table… This is not the preferred way, because it’s a bit complicated – and it’s not too flexible either. A better solution is to handle this query as a table – but in reality, put it as a subquery into another query. Note 1: While this solution is very handy, I have to admit that sometimes creating new tables is more efficient in terms of CPU-time. That would be a bit too advanced of a topic, so I won’t go deeper into it in this article. Hint 1: this is a difficult query; first try to sketch and design on paper how it will work! 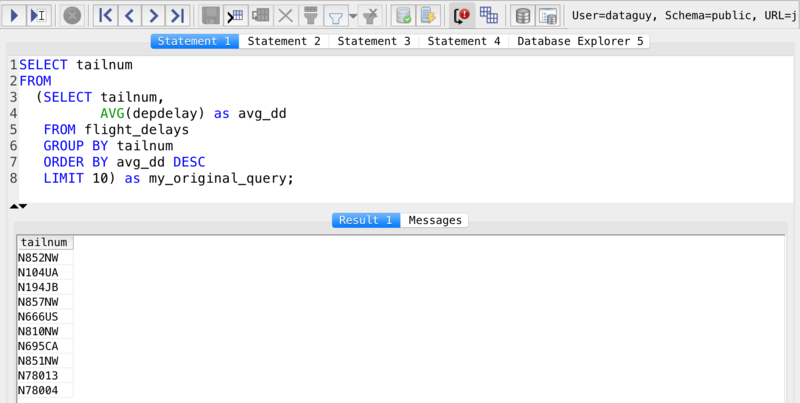 Hint 2: okay, it’s not that difficult, as you will be able to reuse the SQL query from the previous section. Note: I’m pretty sure there are other SQL queries that would deliver the same results and you are more than welcome to write them in the comment section. See? Nothing new has happened here – only that we have combined sub-queries with other sub-queries. To have all the variations you can change the = in the WHERE statement to < and to >. If you are familiar with if statements, it’s not too hard to understand what’s happening here: it categorizes the flights based on the depdelay column into 3 categories. See? The trick is that the CASE WHEN statement is creating a new column at the end of the table. 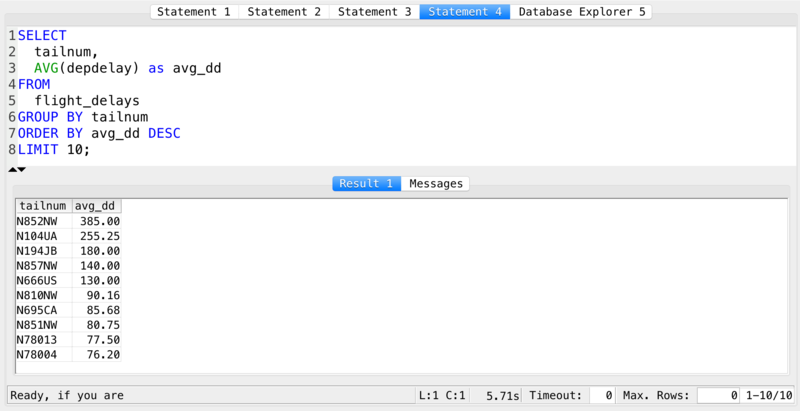 To be honest I don’t use the SQL CASE statement too often during my daily job… but sometimes it’s very handy when I have to do some quick and dirty data cleaning/transformation (e.g. change all the values from ‘M’ to ‘Male’ and from ‘F’ to ‘Female’ in a table) or turn a continuous value into a categorical value (like we did in the above example). You will need SQL HAVING for complex queries. The only good reason that the SQL HAVING clause exists is the fact that you can’t use SQL WHERE with aggregate functions. But why is that? Here’s a short explanation! Now we want to see only those airports that show up more than 10,000 times (means that the COUNT(*) is greater than 10,000). I think a junior SQL person would try this one. NOTE: THIS QUERY WON’T WORK. The only unfortunate thing is that you can’t use your aliases in your HAVING statement, so you need to type the whole COUNT function again… But we can deal with that! Nice!! This were some advanced SQL queries! And you have gone through them! Even better: you are done with my SQL for data analysis tutorial series! Congrats! If you have read and worked through all 6 episodes, you can proudly say that you are familiar with SQL. If you want to be better, I’d like to ask you to do 3 things: practice, practice and practice! Great tutorials, Tomi! Thanks to you I was able to get up and running in no time and do a quick data analysis on new property sales for my wife. I ran the analysis on my Digital Ocean server using the bash functions (cat, cut, etc.) from your earlier tutorials, copied the data into my database, and then ran a query to get the addresses of new home sales in particular zip codes and within certain market values. Your tutorials are awesome, thank you! In fact, that gives me a lot of motivation to keep them coming – so thanks a lot for the feedback! I appreciate it! Thank you a lot for your tutorials. They are very usefully! I was looking to refresh on my SQL skills and this 6-episode-tutorial was exactly what I needed. I feel confident now to go on and start practicing on my own. very helpful tutorial – thank you! And glad you found your way to get this done in MySQL, too! Worked as well. No need to introduce another sub query. Although, I’ll leave there the example for demonstrating subqueries. I can’t find 30-days SQL challenge. Is it up yet? Very good posts and website that I have learned lots of knowledge of Data Analytics, thanks. because Group by comes before Select, when SQL executes group by segment, SQL did not recognize “segment” which comes from Select clause. I don’t know if my understanding is correct, but you still got results. thanks for the question! To be honest, I don’t know the exact answer and I couldn’t find anything online that provides a definite answer for your question… Although, my best guess is that “CASE” executed – independently from the SELECT statement – before the GROUP BY statement. But if anyone finds a better answer, don’t hesitate to comment! I just tested case statement + Group by , seems the combination does not work, getting error of “Invalid column name”. I am just curious about when you run your query, did you meet any error or simply got the output? PS. I used MS SQL. hmm. tricky – TBH, I’m not really familiar with MS SQL, sorry… but it’s like 99.9% sure that issue comes from the difference between MS SQL and PostgreSQL. Thank you Tomi for this awesome tutorial. I learned SQL from scratch and this tutorial is super helpful. Thank you very much!!! I just added the avg when I was about to order the list. The results turned out to be the same as your results. It looks correct to me. Is this something which one could do, or is it maybe less ‘proper’ to use it this way? Yeah, spot-on – and indeed, Nisha has already found this one. Regardless: Great catch and thanks for the comment!